"Campaign may invite a certain skepticism about democracy, but it will surely restore your faith in cinema verite." "The sensation of the Berlinale"
"A grandiose introduction to the Japanese mentality"
"A parody profiling the fascinating personality of its hero"
"CAMPAIGN is the very best kind of Direct Cinema." the funniest film in the Forum." gives us an effortless inside look at 'J-Democracy' (Japanese Democracy)." "The lack of preparation was a blessing in disguise for this film. The camera is relentlessly close to its subject--nothing is directed." "CAMPAIGN is a crash course on Japanese politics." 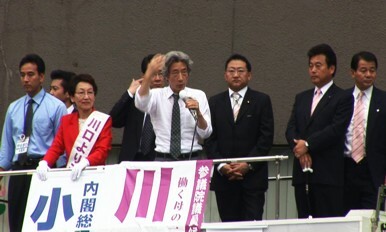 not only of Japan's election campaign process, but of its culture and society as well. "One of those rare treasures that is both frightening and funny at the same time." FUNNY and SUSPENSEFUL-- part Lost in Translation and part The War Room. and really captures the senkyo (campaign) mood. Congratulations! becomes a microcosm of Japanese canvassing politics as whole. an outsider. Indeed it is this that makes this movie so UNIQUE and NEW. and in particular, the mighty machine of the country's ruling Liberal Democratic Party. The result is an insightful, ironic portrait of campaigning at street level. CAMPAIGN allows us to look deep into the inner life of Japanese politics.